Benny’s back! My favorite of the new generation of JM artists is out with a fresh new sound. As always, his voice and energy bring wonderful sparkle, as his vocal maturity is showing. Fans of his (and Ian Freitor’s) No Lyrics will love this record, as Freitor’s electronica has a distinct influence throughout the album. That’s where things start, with the hazy disco Yesh Tikva – a brilliant song pulled off nicely. I’d have only liked to see more vocal surprises, as in a bit of spontaneity as Benny keeps things focused on the basic disco feel – echo and voice machine subtlety amid the steady beat and repetitious work on the chorus. Don’t expect the song to be listened to in Sderot, though, as there’s an electronic piece at 2:52 that brings to mind an air raid siren – while I like the idea, I’m afraid it’ll freak out people who are unfortunately used to these things… I do like Benny’s falsetto in the bridge, though. Great song – this is an obvious hit. Haboicher is a straight rocker, guitar power provided by Aryeh Kunstler, with an excellent bridge at 2:26 that really showcases Benny’s versatility. I’d have liked to hear the ending stretched out a bit longer – it’s cut off just a bit too short. But this song is another shot of energy. Besheim Hashem goes the other direction – a sweet crooner in a duet with newcomer Marc Levine. Levine’s voice is tender and sweet, and Benny provides a solid counterpoint as they sway through it. This tune is this album’s lighter-song, as Uk’sheim was on Taamu. Pretty song, pretty execution, though the modulation at 4:17 is a bit abrupt. As for the orchestration, the solo trumpet in the middle with the backing strings is a bit weak. I’d have gone with acoustic guitars or a French horn. But that’s just nitpicking. Maaleh is my song of the album, with its catchy and original lyrics and fiery guitar (thanks, Avi Singolda!) sprinkled liberally throughout. Here, Benny really uses his voice to great effect – pulling out spontaneous inflections that balance perfectly off of Yitzi Spinner’s creative harmonies. He does here what I’d have liked to see in Yesh Tikvah. My critiques are simple and not that important – when it comes to harmonica, either go to the real thing or skip it. The song begins with a computerized harmonica – it just doesn’t do it justice. That one tiny detail gets forgotten in a hurry, as Benny seriously puts everything he’s got into Maaleh – full throttle. Just listen to this one again and again! Sholom Aleichem – sorry guys, I don’t get this one. The intro is all over the place – starting with a falsetto Brazil Sholom Aleichem (imitating Abish Brodt, maybe?) which warps into the classic Sholom Aleichem, which is itself electronically warped into an accordion/bass duet that starts this disco piece. Points for creativity, but the composition, while not bad, isn’t strong enough to hold it all together. Or maybe I’m just biased against disco music. (I don’t mind one song per album, but more than that gets to my head – I find the track-beat brainless.) The theme of the intro makes a second appearance for a bridge at 3:42, but since I wasn’t crazy over it the first time, it doesn’t get better with repetition. My guess is that with a different genre running the arrangement, I’d rate this number higher – and in fact, on another production of this song (Kumzing 2) it’s much more palatable. Picking things back up, Mamleches Kohanim (a moderate song that picks up speed and energy throughout) goes back to the extremely skilled guitar-playing, which really kicks the song into 5th gear, especially as it ramps up towards the song. Benny kicks out a Birchas Kohanim-inflected “Kohanim!” at 3:30 which is spectacular, and fills out the finale perfectly, with an infusion of power harmonics atop a solid choir. The arrangers’ usage of the power of each of these skilled musicians – that impressive guitar of amid Benny’s splendid voice – is really noteworthy. Here they took a song that could have gone nowhere, and just pulled everything possible out of it. A funky intro that begins Ivdu, however, goes too far and reaches into the realm of over-orchestration. Too much running around with choir, horns, guitars, strings and keyboards all at full blast. It’s exciting, but the tune doesn’t get my soul. The really nice solo work on the keys at 2:51 doesn’t really fit the song well – although it’s great as a stand alone. Honestly, the orchestration would do better minus the horns and strings; it would compliment those keys better. Dor Acharon sounds exactly like a Hillel Palei tune, but it’s another piece by Elimelech Blumstein, who created four other works on this record. Compare this piece with MBD’s Shir Chodosh (from Maaminim); so similar to me that I keep expecting to hear the latter’s lyrics. It likewise uses a lot of different string instruments –mandolin and guitars make various visits into the arrangement. Nice tune, but by this time, we have heard enough of this style that this comes out as a bit passé. Vahaviosim is this album’s No Lyrics – spacey electronica coolness rules the day. A bit too repetitive for me, but I understand the new-age feel they were working with. Again, Benny’s sweet yet full voice projects nicely over of the sleek, glittering background Freitor provides. The background vocals surprise me sometimes – I’d have liked them to be a bit more subtle to match the low key electronica, and I think the song could have done fine without them. 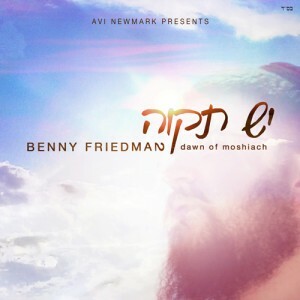 The exit is reminiscent of the finale on Boi Yovoi Moshiach, from Benny’s first album, and is not needed either. Critiques notwithstanding, it’s a good song. While Dawn of Moshiach‘s intro is a bit abrupt coming off of the last song, and it starts off on the slow side, it soon explodes – on multiple levels. For one, I’m very happy with songs that combine original lyrics with psukim, and that’s what we have here. But more importantly, Benny belts it out at 2:33 – I mean, he really lets it rip! That’s what really makes this song. Yes, it’s a nice song, but when a singer uses his voice with that kind of power without losing control… That’s why I’m a fan of this guy. Funky arrangements (great job on the drums) and a reggae inspired bridge at 4:02 provide a fun flavor. I’d have preferred a vocal outro over the standard musical finale presented. Berachamim introduces another guest, and the composer of three of these tunes, Ari Goldwag. Benny and Goldwag make a beautiful fit together, and the two emote their way through this beautiful tune with ease and class. Granted the beautiful words of Shema Koleinu have been used dozens of times, Goldwag tosses in the diminutive Tatte, alongside some heartfelt English lyrics (albeit – let’s admit – pretty cliche) beginning at 3:27. A gentle but firm arrangement holds everything together in a tight groove, making this an excellent finale for another excellent album. For those of you who were wondering, Benny’s fo’ real. Fo’ shizzle.